Six areas in the UK will soon be trying out broadband technology that provides data at speeds approaching one gigabit per second (gbps). Businesses, schools and hospitals will be the first to try out the "full-fibre" network technology. The pilots will be run in Aberdeenshire, West Sussex, Coventry and Warwickshire, Bristol, West Yorkshire and Greater Manchester. The government will spend about £10m getting the pilots up and running. 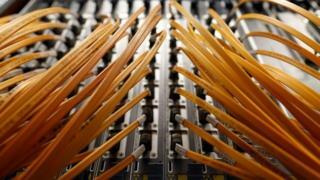 The technology involved is known as full-fibre because it takes high-speed cables directly to premises. By contrast, much of the existing fibre services in the UK connect the fast cables to roadside cabinets and then rely on older, slower copper for the final link to homes and other buildings. Currently full-fibre networks are only available to about 2% of premises in the UK. The government hopes that the projects will significantly boost the availability of the technology. What is full fibre broadband? The preferred technology of Openreach, the body that runs much of the UK's fibre network, has to date been fibre to the cabinet. That means that homes and businesses are connected by a slower copper-based connection to local street cabinets, before the fibre optic network takes over. Full-fibre broadband uses fibre to the premises (FTTP) technology, which is widely regarded as the best way to deliver fast internet services. Here, the fast-fibre optic cables run directly to homes and offices, providing a more stable, efficient and reliable connection than the hybrid copper and fibre systems. They can also support broadband speeds of up to 1Gbps, enough to download an HD TV programme in five seconds. "How we live and work today is directly affected by how good our broadband connection is," said Andrew Jones, Exchequer Secretary to the Treasury, in a statement. Faster, more reliable connections would create jobs, help new industries to emerge and let people work more flexibly, he said. Possible uses of full-fibre broadband would include hospitals sharing high-definition images to aid diagnosis, or schools using video more effectively during lessons. However, broadband market analysts have pointed out that gigabit-capable cables would be shared with many different premises, suggesting that actual data download speeds would be much lower than the theoretical maximum. The gigabit speeds that are possible with full-fibre are much faster than the 10 megabits per second (mbps) which the regulator Ofcom says modern families need to meet their requirements. Last month, the government published information about the work being done on its broadband delivery programme, which aims to improve download speeds across the UK. It claimed that 93% of premises in the UK can now get superfast broadband services, which run at speeds of about 24mbps. Cash for the gigabit-speed broadband pilots comes from a £200m fund announced in the budget earlier this year. The government said it aimed to spend the remaining balance of the fund by the end of 2021.